WASHINGTON (CNS) — During the second year of his pontificate, Pope Francis was still feeling the love, and not just from Catholics or those from his homeland of Argentina. 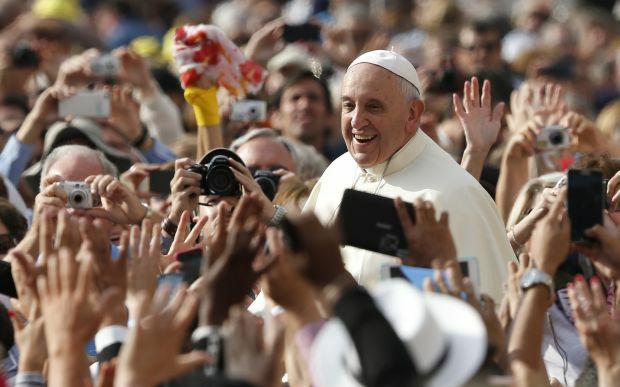 A Pew Research Center study released Dec. 11 showed that the pope has broad support across much of the world. Sixty percent of the 43 nations polled had a positive view of the pontiff. And Americans, in particular, have shown their fondness for Pope Francis, often extolling his simplistic style. According to the Pew study, 78 percent of Americans view the pope favorably. He recently told Catholic News Service that 2014 brought worldwide attention to almost everything Pope Francis said and did — which “in so many ways,” he said, made the U.S. bishops’ work easier. And the bishops were not the only ones to recognize the pope’s appeal. The pontiff, who was on the cover of many magazines in 2013, still had the coveted cover spot — not usually reserved for religious leaders — on Rolling Stone magazine this February. He was also the topic of a number of books issued this year and innumerable Catholic discussions either during coffee and doughnut socials after Masses or larger-scale symposiums at Catholic universities. During a Feb. 3 talk on the “Francis factor” at Georgetown University, panelists used descriptors such as “troublemaker” and “anti-establishment” in their discussion about Pope Francis. They also commended his strong leadership and management style and of course, his popularity. Kerry Robinson, executive director of the National Leadership Roundtable on Church Management, said the pope’s strongest action so far had been urging people to personal conversion. At the same gathering, hosted by Georgetown’s Initiative on Catholic Social Thought and Public Life, John Allen, associate editor at the Boston Globe, said there are likely some cardinals who might say the pope has done things that make them nervous, but they would still no doubt appreciate his overall appeal. One catch, so far with the pope’s popularity, is that it has not, as of yet in the U.S., drawn more people, or those who have left the church, back to Mass or the sacraments in measurable numbers, according to a Pew Research Center poll earlier this year. Some observers have said the pope’s impact shouldn’t be measured in returning Catholics, but in the restored image of the Catholic Church and the number of Catholics who feel proud of their faith again thanks to Pope Francis. Eileen Burke-Sullivan, associate theology professor at Creighton University in Omaha, Nebraska, told CNS in March that in visits to various parishes in the country, she heard numerous stories of parents’ grown children who have been inspired by the example of the pope and want to come back to the church. She also said parishes should be prepared for these returning Catholics and be sure they are ready to serve as “field hospitals” welcoming all, as the pope has said they must do. This fall, the pope had a lot of eyes on him during the extraordinary Synod of Bishops on the family at the Vatican. The pope opened the first working session, but never expressed his views during the gathering. At the synod’s end, many news outlets said the final report was a “setback” or “loss” for the pope, because it did not include the midterm’s conciliatory language toward people with ways of life contrary to church teaching, or reflect the theme of mercy, the pope so often articulates. The cardinal said the pope doesn’t “represent a traditionalist or a progressive scheme,” but instead “wants to lead faith and morality back to their original center,” to the heart of the Gospels. That’s a recurring theme of Pope Francis and for many it was echoed in the pope’s appointment this fall of Archbishop Blase J. Cupich as the new archbishop of Chicago. The archbishop’s simple and very pastoral style has often been compared to Pope Francis. And certainly many Catholics will accompany each other next fall when Pope Francis will make his first visit to the United States to attend the World Meeting of Families in Philadelphia in late September. Plans call for the pope to attend the Festival of Families Sept. 26 — a cultural celebration expected to draw up to 800,000 participants — and to celebrate Sunday Mass the afternoon of Sept. 27 on the steps of the Philadelphia Museum of Art for a crowd of about 1 million people. Donna Crilley Farrell, executive director of the 2015 World Meeting of Families, said numbers for the gathering are expected to grow each day and could reach close to 2 million people. Other details of the U.S. trip have not been announced, but this summer Pope Francis told reporters that President Barack Obama and the U.S. Congress had invited him to Washington and that the U.N. secretary-general had invited him to New York. Other cities that have put in “bids” for the pope to visit, through letter-writing campaigns or personal pleas from civil and church leaders include: Birmingham, Alabama; Boston; Buffalo, New York; Chicago; Dallas; Detroit; El Paso, Texas; Green Bay, Wisconsin; St. Augustine, Florida; and Tucson, Arizona. Eustace Mita, a member of the World Meeting of Families’ board of directors, similarly believes the pope’s visit will make an impact, saying it will be felt for decades in the Philadelphia region. “He truly is the pope of unity, bringing Catholics and non-Catholics together,” she said.